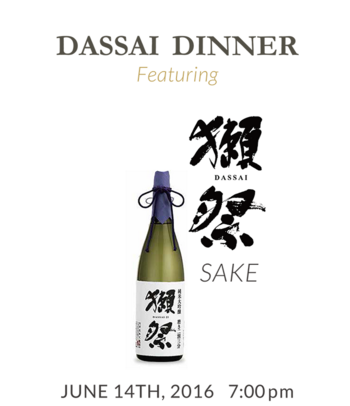 Tuesday, June 14 from 7:00 p.m. until 9:30 p.m.
Dassai Brewery and TEISUI, a new Japanese yakitori kaiseki restaurant in NoMad, host a beautiful evening of sake and custom-made dishes to match and highlight each of the award winning sakes from Dassai Brewery. Chefs Nobutaka Watanabe and Yuichiro Yoshimura designed six dishes around the specific flavors and seasonal ingredients to align with the elegance and refinement of Dassai’s sake. Craig A. Tabandera, one of NYC Dassai’s leading managers, will also give guests a Sake 101 lesson to explain how to taste the flavors and components in sake and pair against food. Each guest will receive a complimentary Dassai Brewery Champagne flute. To make a reservation, please call 917.388.3596 or visit TEISUI’s Eventbrite page.